Sunday, Mar. 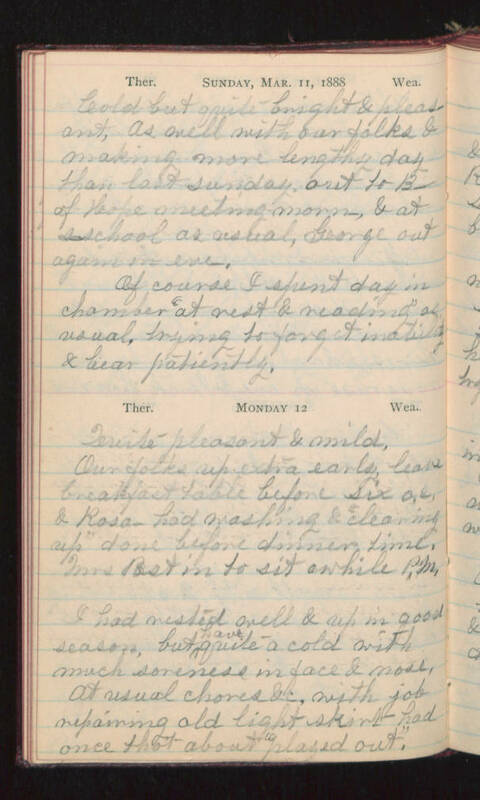 11, 1888 Cold but quite bright & pleasant, as well with our folks & making more lengthy day than last sunday, out to B- of Hope meeting morn, & at s-school as usual, George out again in eve. Of course I spent day in chamber "at rest & reading" as usual, trying to forget inability & bear patiently. Monday 12 Quite pleasant & mild, Our folks up extra early, leave breakfast table before Six o,c. & Rosa had washing & "cleaning up" done before dinner time. Mrs Post in to sit awhile P.M. I had rested well & up in good season, but have quite a cold with much soreness in face & nose, At usual chores &c, with job repairing old light skirt had once that about "played out".